The Global Volcanism Program has no activity reports for Harrat 'Uwayrid. The Global Volcanism Program has no Weekly Reports available for Harrat 'Uwayrid. The Global Volcanism Program has no Bulletin Reports available for Harrat 'Uwayrid. The Harrat 'Uwayrid, located in NW Saudi Arabia along the Bedouin pilgrim route to Syria, contains young basaltic scoria and tuff cones and associated lava fields. The massive alkali olivine basaltic lava field reaches a height of 1920 m; it extends about 125 km in a NW-SE direction and is contiguous with the Harrat ar Rahat volcanic field to the NW. The Catalog of Active Volcanoes of the World (Neumann van Pandang, 1963a) indicated that an eruption in about 640 CE at Harrat 'Uwayrid may have been from either Hala-'l-Bedr or Hala-'l-'Ischia, or both. Bedouin legends say that Hala-'l-Bedr erupted fire and stones, killing herdsmen and their cattle and sheep. Brown G F, Schmidt D L, Huffman A C Jr, 1989. Geology of the Arabian Peninsula. Shield Area of Western Saudi Arabia. U S Geol Surv Prof Pap 560-A (replaced Open-File Report 84-203). There is no Deformation History data available for Harrat 'Uwayrid. There is no Emissions History data available for Harrat 'Uwayrid. 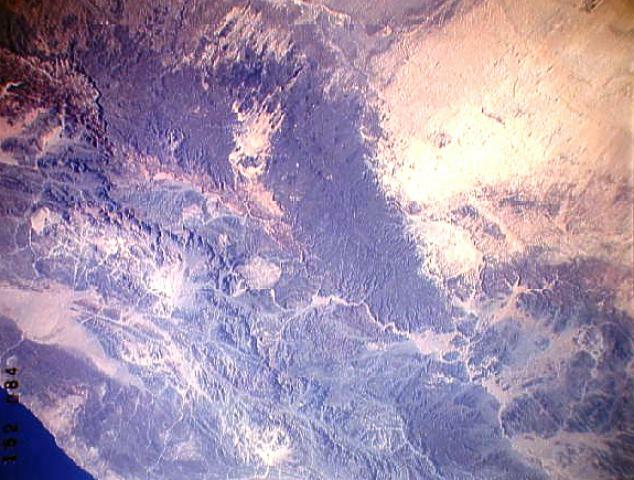 The large dark wedge-shaped area pointing to the lower right near the center of this Space Shuttle image is Harrat 'Uwayrid, a major volcanic field in NW Saudi Arabia. Harrat 'Uwayrid lies on the Bedouin pilgrim route to Syria and contains young basaltic scoria and tuff cones. Bedouin legends say that Hala-'l-Bedr erupted fire and stones in 640 CE, killing herdsmen and their cattle and sheep. Another volcanic field, Harrat ar Rahah (upper left), lies to the NW, left of the small light-colored desert area at the upper left-center. NASA Space Shuttle image STS37-152-84, 1991 (http://eol.jsc.nasa.gov/). There are no samples for Harrat 'Uwayrid in the Smithsonian's NMNH Department of Mineral Sciences Rock and Ore collection. Large Eruptions of Harrat 'Uwayrid Information about large Quaternary eruptions (VEI >= 4) is cataloged in the Large Magnitude Explosive Volcanic Eruptions (LaMEVE) database of the Volcano Global Risk Identification and Analysis Project (VOGRIPA).